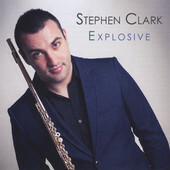 Stephen Clark’s debut album, Explosive, is a crossover album featuring flute arrangements from diverse sources, ranging from music from the Irish dance show Lord of the Dance to Guns N’ Roses. This Scottish flutist, who studied at the Royal Scottish Academy of Music and Drama and the Royal Northern College of Music, combines a beautiful, rich, powerful tone with some fun repertoire that you might be surprised to hear on a flute CD. Clark opens with a cover of “Explosive,” written by Tonci Huljic and performed by Bond, the British crossover string quartet. This piece is fast-paced and is an energetic opening to the album. He moves in a different direction with a cover of John Denver’s lyrical “Annie’s Song,” which has also been covered by James Galway. Coldplay’s “Viva la Vida,” from their 2008 album Viva la Vida or Death and All His Friends is convincingly played next by Clark. The flute tracks, all performed by Clark, are layered, which creates a full, complex piece. Various types of film music are included on Clark’s album. One track is from The Mission, a 1986 British drama starring Robert De Niro. A second movie-related track is from the 1997 film Titanic starring Leonardo DiCaprio and Kate Winslet. “The Prayer” is a cover of a 1999 duet between Celine Dion and Andrea Bocelli. Three tracks (“Siamsa,” “Lord of the Dance,” and “Whispering Winds”) were written by the Irish composer Ronan Hardiman, who composed the soundtracks to the Lord of the Dance and related dance shows. These show Clark’s command of difficult articulation; it is consistently clear, clean, and crisp. The last track, “Whispering Winds,” also features some very nice timbral trills. Perhaps the most unexpected track is a cover of Guns N’ Roses’ “November Rain” from their 1992 album Use Your Illusion I. These tracks might not be what you expect from a flute album, but it certainly is a fun collection. Perhaps more importantly, each track is expertly executed. Learn more about Stephen Clark at his website, www.stephenclarkflute.com, or on Twitter at @stephenflute. This review was originally published in the January 2014 issue of The Flute View magazine. Subscribe here!